Le Parqueteur specialises in high quality flooring solutions, with a focus on parquetry flooring in Melbourne. We are heavily inspired by the classic, antique parquetry flooring that is often seen in old castles, palaces and mansions. In addition to being very attractive, this type of flooring is very hard-wearing and designed to withstand heavy foot traffic. Here at Le Parqueteur, we would like to demonstrate that you do not need to live in a palace to enjoy this artistic and stylish type of flooring. We are here to bring parquetry flooring to Melbourne homes. 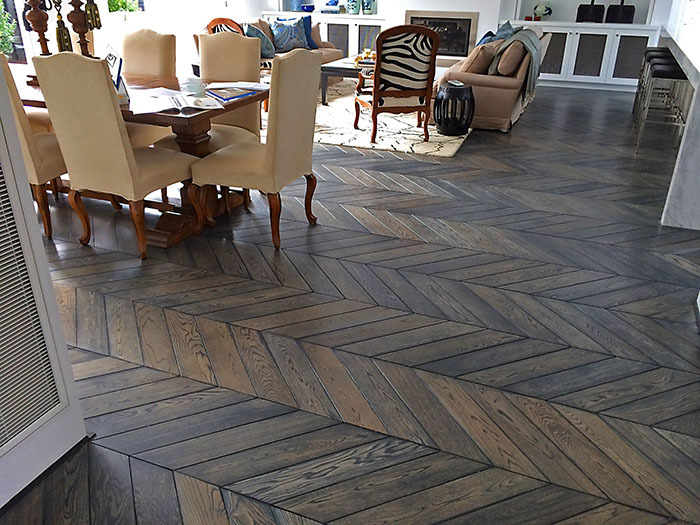 At Le Parqueteur, we deal with all aspects of parquetry flooring. We are involved in all stages from design through to installation and finishing, with a team of 30 years’ experience on the job. We combine traditional techniques such as milling, adhesion and direct colouring, with modern technology to bring you an improved approach to a historic art. As everyone’s tastes and budgets vary, we have a variety of different types of timbers and services for you to choose from. Our range includes European, American and French Oak flooring, as well as engineered timber. Each has various different benefits. We can install a parquetry floor in all manner of houses and indoor spaces, with a specialised made-to-measure service. Speak with us today and we can talk about what materials and services will suit you best.